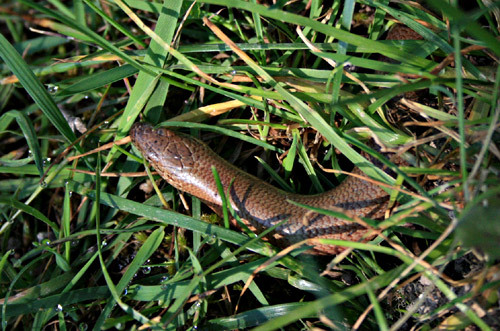 Something brown and snake like spotted by the pond this morning! I just spotted this little fella this morning by the pond. So exciting as I’ve never seen anything like it before in the garden. He’s approximately 30cm in length and has the cutest little face. 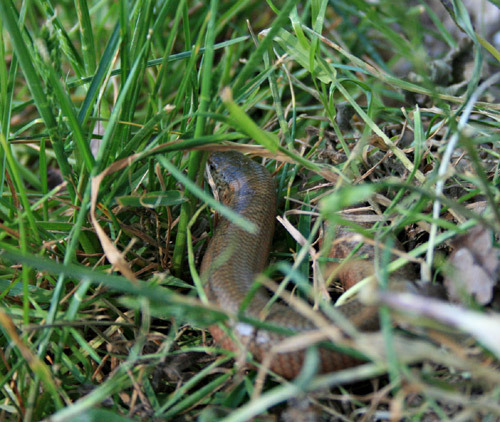 As soon as I spotted him on the lawn I rushed inside and grabbed my camera and fortunately he was still there, so I managed to grab a few pics before he slithered away into the long grass. He popped his head up to take in some of our Spring sunshine. 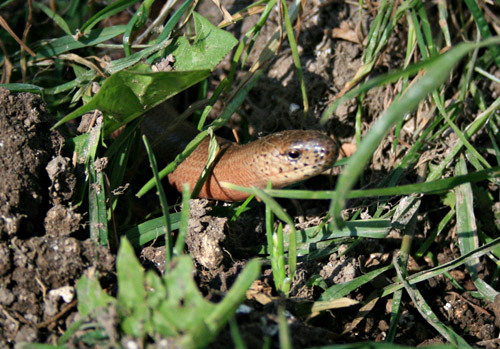 At first I thought it was one of our native snakes, but after researching on the web I think it’s a Slow worm, which isn’t a snake, but is actually a legless lizard. Either way it’s a real find and I hope he makes himself at home alongside our new wildlife pond.